NORCROSS, Georgia (CNN) -- Beneath seven flat-screen TVs and one large pulldown screen, members of the Racquet Club of the South gathered Monday to watch and celebrate one of their own. 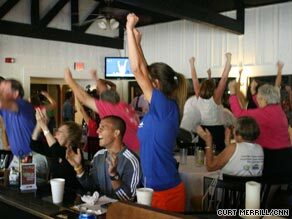 Members of the Racquet Club of the South erupt when Melanie Oudin beats Nadia Petrova. Melanie Oudin, 17, of Marietta, Georgia, has taken the tennis world by storm at the U.S. Open. The 70th-ranked female has upset some of the sport's biggest female stars, including Russian aces Elena Dementieva (No. 4 seed) and Maria Sharapova (No. 29 seed, who has been ranked No. 1 worldwide in the past). And on Monday, she beat 13th seed Nadia Petrova in three sets. Her latest win makes her the youngest American to make the quarterfinals since Serena Williams in 1999. "It's still so surreal," said Anne Keeton, player liaison at the club, before the match started. "She sort of wins no matter what happens. She's there going for it and not giving up." At this suburban club, co-owned and co-directed by Oudin's longtime coach, Brian de Villiers, articles about the local tennis phenom dot the walls. In the Grill, on a Bud Light message board above drink specials, are the words "Congratulations Melanie!" And a photo of her mixed in with other young players is posted near a downstairs fitness room. Blending in with others and not retreating to "a Melanie court" is part of what makes her special, Keeton said. When there was a flood on some indoor courts this year, she was down there squeegeeing with everyone else. "She so lovely and so accessible," Keeton said. "It couldn't happen to a nicer kid." When Petrova took the upper hand, and the first set, fans erupted into applause with each of Oudin's hard-earned points and offered encouragement like "There we go!" When she pumped her fist in celebration, they did the same. And when a play didn't go her way, they groaned in unison. Her skills were apparent from an early age, said Turhan Berne of Norcross, a coach and tournament director who's known Oudin since she was 9. He watched her rake in wins, beating older kids and snagging No. 1 junior rankings in the country and world. "But you know when I knew she was going to be something?" he said. "She would play with anybody her coach had her hit with. ... She always gave back. She's very grounded. Her parents and coach did a great job not letting her fame and success change her into a different person." As Oudin came back for the second set, the crowd held its collective breath. With every point she earned, they hooted, hollered and exchanged high-fives. They booed when they saw Petrova losing her cool, banging her racquet against the net after losing a big point. "C'mon, Melanie!" people screamed as the tiebreaker began in the second set. When Oudin took that set, they rose to their feet, screamed, did happy dances and shared hugs. "It's awesome," said Kathleen Brady of Norcross. "We are so glad her opponent double-faults." "Bless her heart," Lisa Wells chimed in with a laugh, offering the Southern tagline to downplay any insult. Earlier in the day, John Sklare joked that the young pro learned something from him. Over the winter, the Alpharetta psychologist often played on the indoor court beside her. "I knew she was good, but I didn't know she was that good -- and that's what we're all finding out now," he said. He spoke about what a "great kid" Oudin is but then added that what he likes best about her is how quiet she is on the court. Sklare, a former writer for Atlanta Tennis magazine, said he called Sharapova "Screamapova." Oudin, on the other hand, is "like a stealth fighter," he said. "She's quiet, but you know she's there." Her overall attitude is as inspiring as her play, said Jeannette Latimer of Decatur, Georgia, whose 11-year-old daughter, Kelsey, has been playing for five years. "She shows the kids not to get upset on the court," Latimer said. "She's always so positive. If the kids learn nothing else from her, it's her mental toughness." But Kelsey has been more intent on studying Oudin's moves on the court. "I think she has a nice top-spin forehand," Kelsey said. "I think it's better than mine." With Oudin up 5-2 in the third set, anticipation hung in the air. "Both of them are pressing each other, but to see the 70 [ranked player] outplaying 13, that takes heart," Ernie Jensen of Woodstock said. Going into the match point, some rose to their feet. Together, the hordes clapped, carrying Oudin to the win. When she took the match, earning her first quarterfinal seat in a Grand Slam, the room exploded. They stood by and watched, smiling widely and some wiping away tears as Oudin gave her victory speech. "It's like something so big happening to all of us all at once," said Jennifer Silverberg of Alpharetta. "Watching her, it's like watching your own little girl. ... My heart's still going crazy."